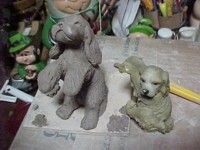 The sculpting of the dogs was done by me, Joan, but the wonderful pots were made by Cocker Spaniel Club member, Linda Honsperger. 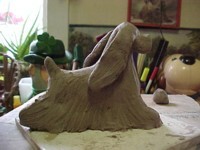 Only with her expertise and materials was I able to begin playing with clay. 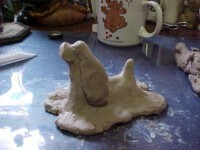 In the future, I hope to have pottery sculptures available for sale to other Cocker Spaniel lovers. If you are interested in seeing more, please contact me at barval@highvision.net.